Those of you who know me know I have nothing but love for the San Francisco Public Library. You can order books online and have them sent to your local branch! When your internet is down, you can roll in and use their wifi connection. If you want to learn more about San Francisco, you can go on one of their numerous, historical and, like all of their services, FREE walking tours! In addition to all these services, there's also Project Read, a 30 year old program that provides one-on-one tutoring and workshops for English-speaking adults who seek to improve their basic reading and writing skills. According to the National Center for Education Statistics 30 million adults in the US read at or below a 5th grade level. Project Read states that "in San Francisco, it is estimated that 80,000 adults--one in every five--have some difficulty with basic reading and writing." Never mind not being able to read books on the best seller lists, low literacy has a negative impact on people's ability to navigate basic information related to their finances and health and makes it difficult to find employment. 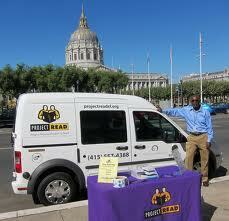 Years ago, I was a volunteer tutor at Project Read. I worked with a grandmother who was raising her grandchild while also working as a case manager for grandparents in the same situation. Coming up with lesson plans was a challenge for me but so rewarding when I saw the progress my learner was making.